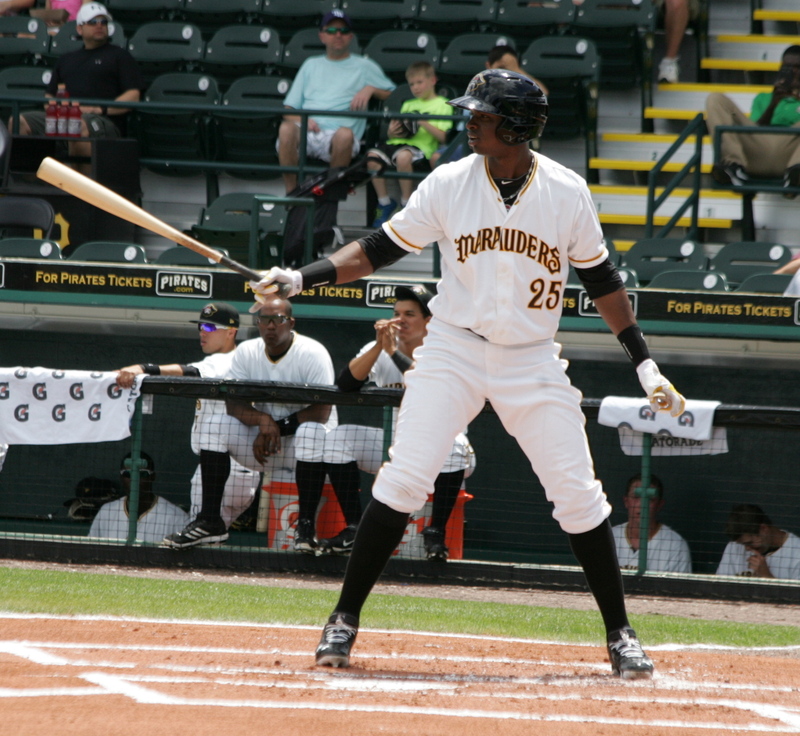 In the Dominican on Monday night, Gregory Polanco extended his hitting streak that started on Opening Day, to nine games. In his second at bat, he lined a single up the middle for his only hit of the night. On Monday, we posted a season recap of the 2013 Pirates right fielders, then questioned whether signing a free agent right fielder this off-season was the right thing to do. One thing of interest this Winter League season, is the fact that all three strong possibilities for the 2014 right field job will be playing this Winter. Obviously, Gregory Polanco is making a strong pitch for that job and he will get an extended look in Spring Training this year, but it is highly unlikely that he will be the Opening Day right fielder. One reason is due to his AAA experience, which consists of a couple late season games and the playoffs. The main reason is team control. If they wait a couple weeks to call him up, they will get an extra year of control out of him. That doesn’t mean they will do that, because you also have Super-Two status to worry about, but if he is ready and by far the best option, then you might overlook that extra cost for the help he would provide over an extra 70 or so games they would get out of him. Around the middle of next month, the other two players competing for that right field spot, will start their Winter League season. Jose Tabata is playing Winter ball in Venezuela for the first time since 2010, although he wanted to play last year. Tabata is just coming into his prime, and he is looking to not only prove that the last two months weren’t a fluke, he is looking to make up for some lost AB’s, because he wasn’t playing everyday. The third player is Andrew Lambo, who will get going in the Dominican around November 15th. He had a breakout season this year and he will be 25-years-old going into next year. Lambo proved he could do well in AAA and the Pirates got a glimpse of him in September, so a lefty-righty combo of Tabata and Lambo could possibly work, giving Polanco time to develop at a normal pace in AAA. Usually, we would have to wait until Spring Training to watch this battle unfold, but these three will be getting it going three months sooner. It will at the very least, give Pirates fans something interesting to follow during the Winter months. Last year it was Starling Marte providing much of the excitement in Winter ball, then he went out and had an excellent first full season in the majors. This year it looks like three other outfielders will provide the excitement, and so far, Polanco is in the lead. *Monday is usually an off day in the Winter Leagues, so no one else was in action. The Escogido game was a make-up of an earlier rainout. * On Saturday, we mentioned Adolfo Flores, a hard-throwing Pirates pitcher that was signed two years ago, but hasn’t pitched a game yet. He made his Winter debut in Nicaragua and gave up no runs and two hits in 1.1 innings. Not sure why you guys keep saying Jose Tabata when speaking about our starting Right Fielder. You guys are talking like he is a rookie we don’t know about. Tim’s article yesterday questioned possibly not giving Tabata an opportunity and finding out about him. We KNOW what Jose Tabata is. A mediocre defensive outfielder who hits for so-so average and provides no power or speed. He doesn’t have 1 plus tool. He is a backup outfielder at the major league level. If we are starting him opening day I will vomit. I do agree Lambo deserves a shot to see if his power will be legit in the majors. At least until Polonco gets the call, which will hopefully be no later than June! I can live with him in a platoon with Lambo early in the year. Hopefully Lambo playing the larger portion of the platoon. Maybe after Polonco gets the call someone will deal for Tabata? I doubt we would get much but maybe a bullpen arm or something. I like the idea that Tim put out and I’m wondering if we will see a hint of it during Winter Ball. I’d have the Tabata/Lambo platoon and if he does well, move Lambo to first base once Polanco is up. Leave Tabata as the backup. I think the only flaw is that it means they didn’t get a legit 1B option either in the off-season. Definitely wouldn’t want to go with Sanchez only to start the year, or Lambo getting time at both 1B and RF. Unless he really carries over his AAA success, that wouldn’t be the best option. It’s one of the reasons that I’m really interested to see what these three do in Winter ball and it is great that both Tabata and Lambo realize how big this off-season is for their career. Yeah I like that too accept we need to open the season with someone better than Gaby Sanchez at first. I wouldn’t mind seeing that in 2015 if Lambo looks legit but I think we need a 1 year bat to play first in 2014. I can understand the sentiment behind wanting to write Tabby off, but John touches on some good points. His .771 OPS in 2013 is only 2 points below Marte’s career number. Obviously Marte adds a ton defensively, but he’s also considered to be an offensive contributor, even discounting SBs. In fact their 2013 offensive #s are very similar with Marte hitting more HRs (though closer than you may think at 1 every 42.5 ABs vs. every 51.3 ABs) and triples, but slightly less doubles (per AB) and Tabata had better BB and K rates. And they’re both 24 years old. Since Tabata has had some maturity issues and he made a large step forward in 2013, it wouldn’t be surprising to see him improve even more as he plays his “peak” years, and hopefully continues to mature. Please don’t compare Jose Tabata to Starling Marte. Marte is going to be a super star and Tabata will be a career backup. This was Marte’s first full season and missed over a month but still led the league in triples, hit 12 HR and stole 41 bases. Most likely would have led the league in steals if not for the injured hand. Not to mention he has a very good shot and really should win a gold glove in his first year. Why not compare them when so many of their numbers are so similar? Besides SBs, the rest this year was a mixed bag, with Marte being better at the glitziest stat (HRs) and Tabata being better at some of the more fundamental ones (BB and K rates, which incidentally Marte’s were awful). Yes we’re all counting on Marte progressing and I wouldn’t be surprised at the stat line you hope for from him, but he will need to seriously improve his plate discipline to get that line. He also needs to improve his SB%, as he did lead the league in caught stealing. At 24, there’s a good chance he’ll make those improvements/adjustments, and I’m definitely counting on him doing so. If anyone is still reading after that last, stat packed paragraph, please know that I’m not equating these two while I am compare them. Obviously Marte has the much higher upside (and SBs and defense can’t be ignored), but he still needs to progress through his prime years to reach that potential. And his prime years, age wise at least, line up exactly like Tabata’s, so why not look for some progress from Jose as well? At the very least he needs to be in the conversation for RF, contrary to what the first line of the original post in this thread says. There numbers aren’t similar, Jose Tabata blows! He will be a career backup. You obviously are clueless!